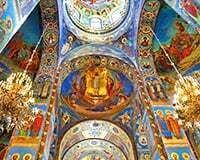 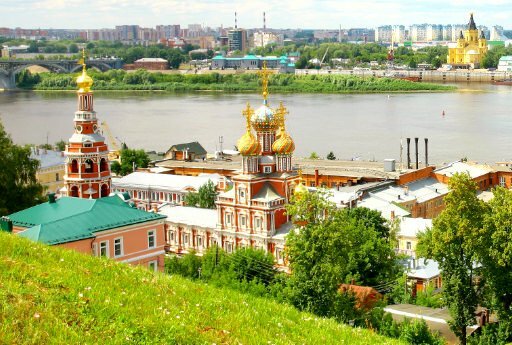 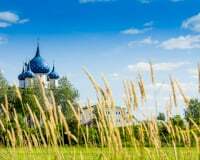 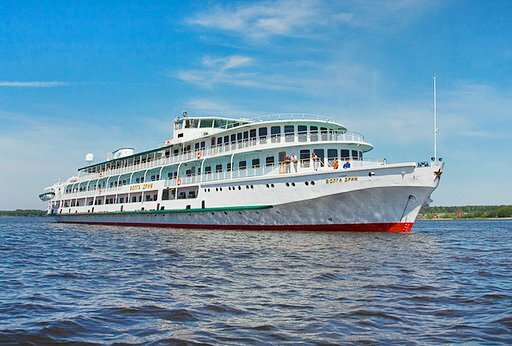 The MS Volga Dream is the queen of luxury travel on Russia’s rivers. 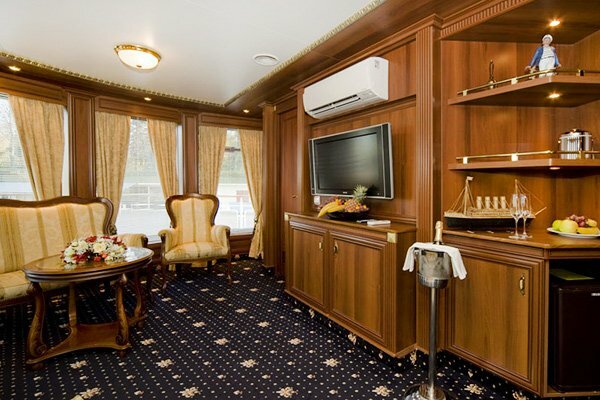 Its owners transformed this classic 1959 cruise boat into a regal passenger vessel, with spacious interiors dominated by beautiful wood paneling and crisp golden accents. 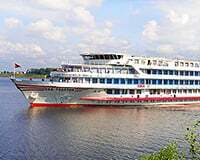 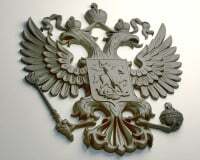 The Volga Dream holds 109 passengers at capacity, and is served by a crew and staff of 60 who cater to every desire. 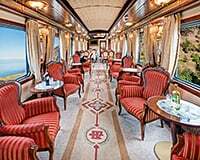 Flat screen TVs bedeck the roomy cabins and feature international satellite programming (important for those with television serials and sports matches that simply cannot be missed). 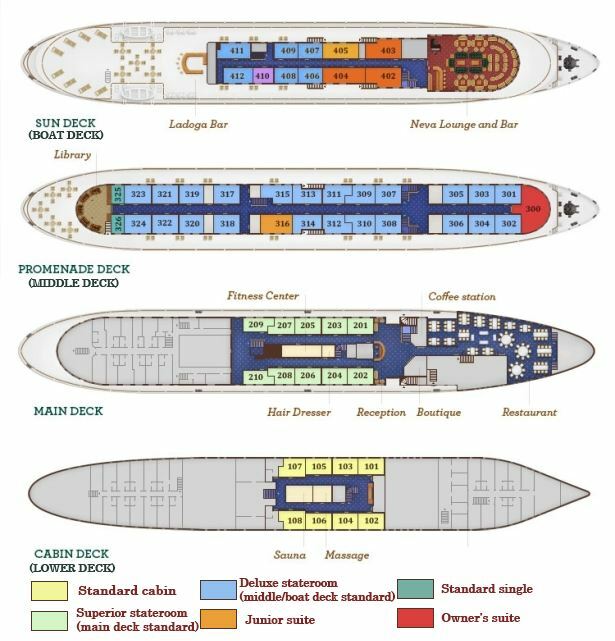 The homey lounges feature plenty of space to stretch out, with WiFi internet access for those who cannot leave their work (or social networking page) behind. 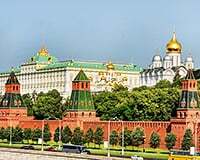 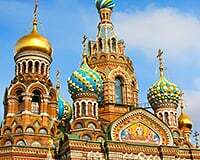 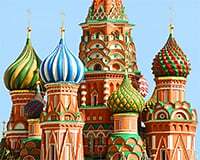 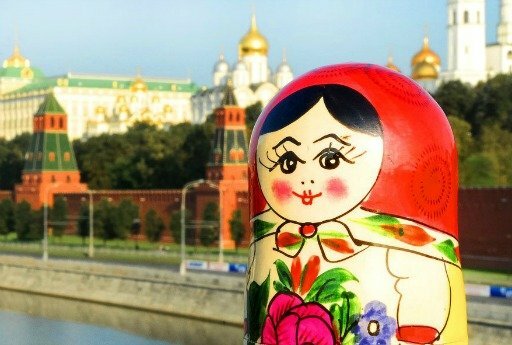 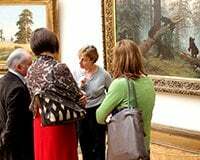 The main highlight of the ship is its lecturing program where renowned professors from the world's most prestigious universities introduce you to the history of Russia, its culture and traditions. 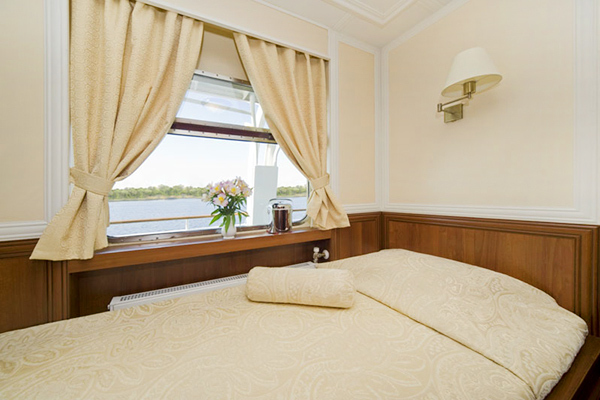 For five-star comfort, luxury, and elegance, the MS Volga Dream is the only choice on the rivers of Russia. 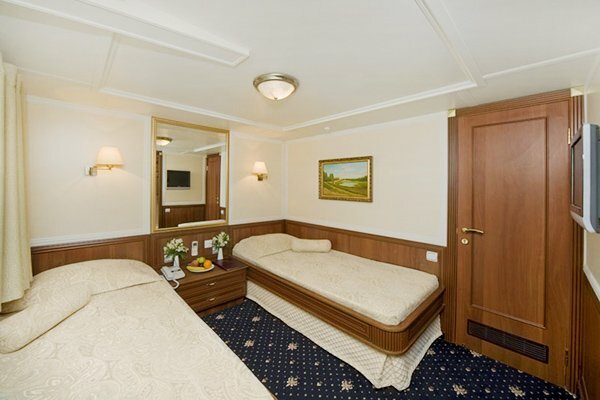 Standard cabins are located on the Middle Deck and are designed for single occupancy. 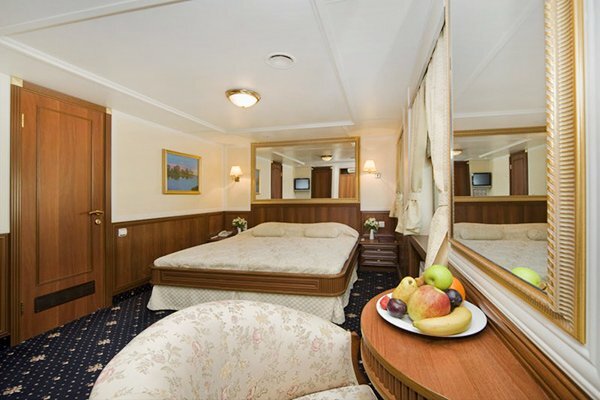 The cabins feature everything you need for a good trip: a single bed, large picture windows, private bathroom with shower, a spacious closet, air conditioning, direct dial telephone, flat-screen TV, private electronic safe, minibar, radio, bathrobes and slippers, hair dryer, bathroom accessories kit, bottled water, welcome fruit basket, 220V outlets and Wi-Fi connection (charges apply). 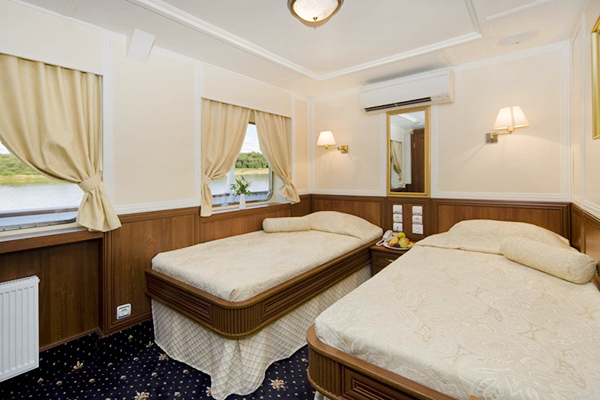 Standard cabins are located on the Lower Deck and are ideally equipped for twin occupancy. 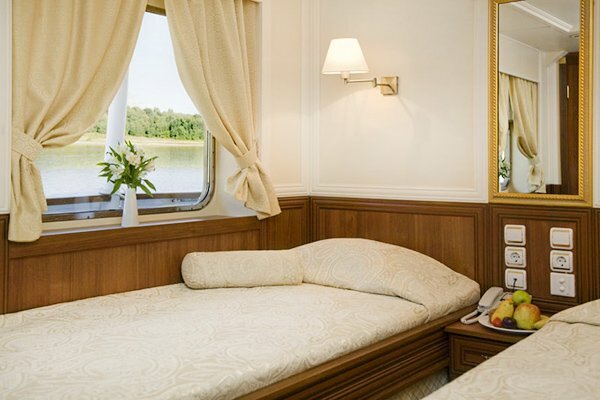 These cabins have two twin beds, porthole windows and private bathroom with shower. 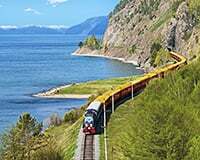 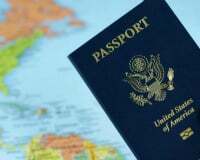 They feature a spacious closet, air conditioning, direct dial telephone, flat-screen TV, private electronic safe, minibar, radio, bathrobes and slippers, hair dryer, bathroom accessories kit, bottled water, welcome fruit basket, 220V outlets and Wi-Fi connection (charges apply). 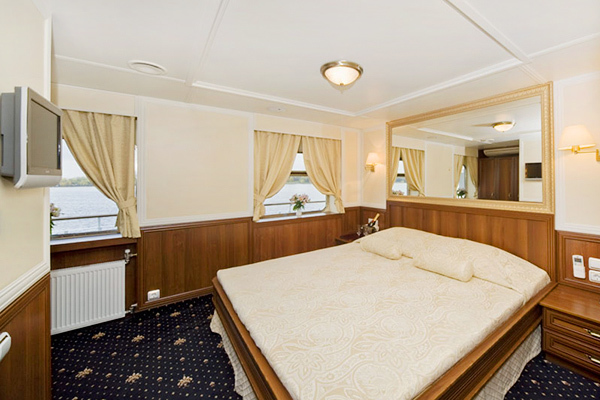 Superior staterooms for twin occupancy are located on the Main Deck. 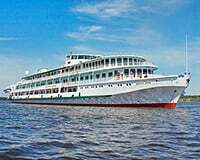 They come fully equipped with all modern amenities, including two twin beds, large picture windows, private bathroom with shower, a spacious closet, air conditioning, direct dial telephone, flat-screen TV, private electronic safe, minibar, radio, bathrobes and slippers, hair dryer, bathroom accessories kit, bottled water, welcome fruit basket, 220V outlets and Wi-Fi connection (charges apply). 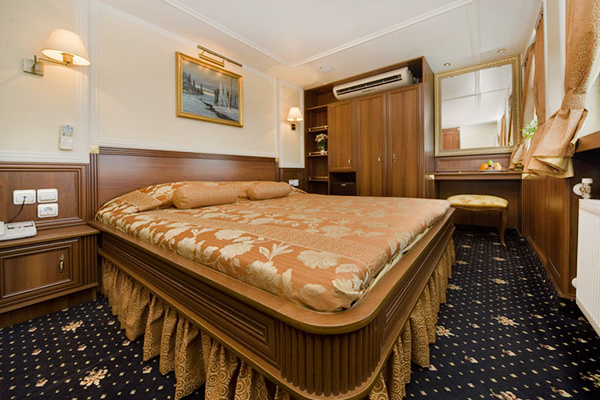 Deluxe staterooms for twin or double occupancy are located on the Boat Deck and Middle Deck. 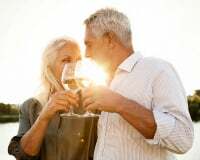 They feature two twin beds or one double bed, large picture windows, private bathroom with shower, a spacious closet, air conditioning, direct dial telephone, flat-screen TV, private electronic safe, minibar, radio, bathrobes and slippers, hair dryer, bathroom accessories kit, bottled water, welcome fruit basket, 220V outlets and Wi-Fi connection (charges apply). 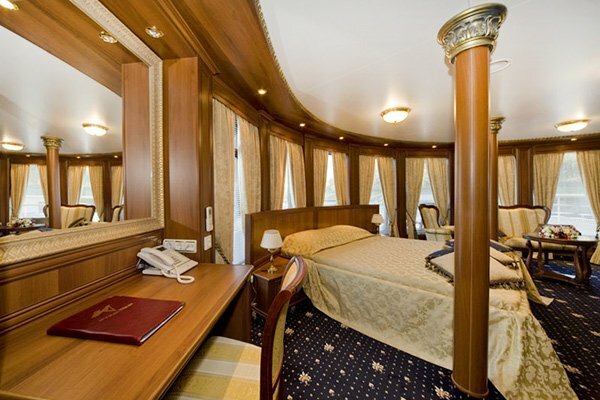 Junior Suites are located on the Middle Deck and Boat Deck and are perfectly equipped to accommodate two guests. 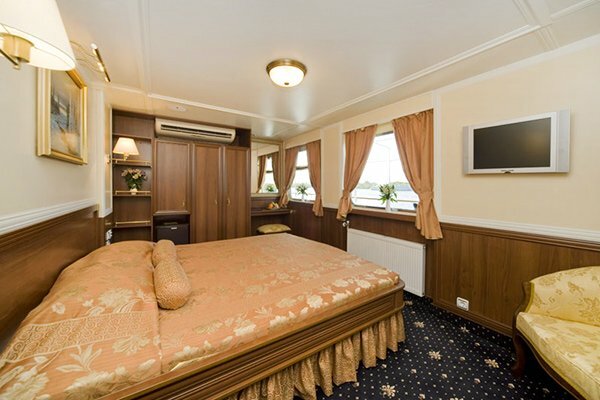 They have everything for a comfortable voyage, including a double bed, large picture windows, private bathroom with shower, a spacious closet, a desk, a chair, air conditioning, direct dial telephone, flat-screen TV, private electronic safe, minibar, radio, bathrobes and slippers, hair dryer, bathroom accessories kit, bottled water, welcome fruit basket, 220V outlets and Wi-Fi connection (charges apply). 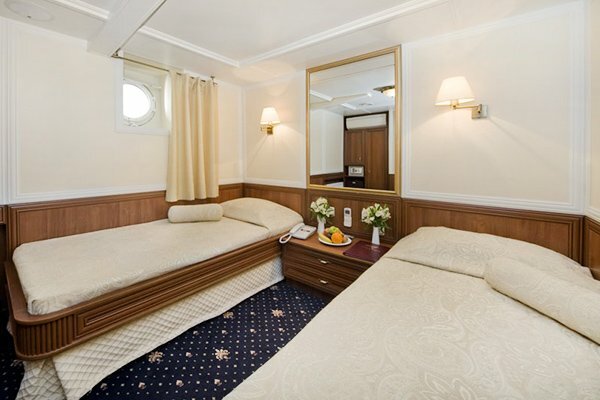 Deluxe Junior Suites for double occupancy are located on the Boat Deck. 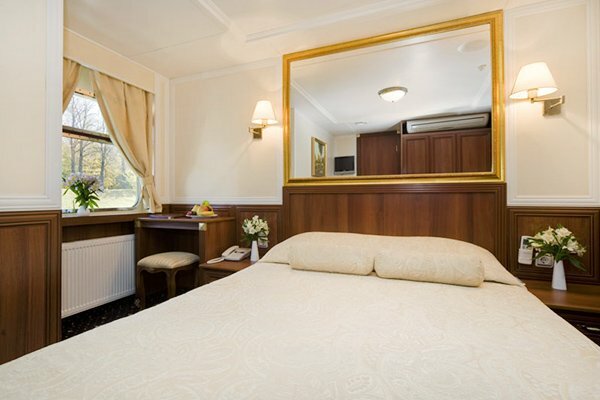 They feature a double bed, large picture windows, private bathroom with shower, a spacious closet, a sofa, a desk, a chair, air conditioning, direct dial telephone, flat-screen TV, private electronic safe, minibar, radio, bathrobes and slippers, hair dryer, bathroom accessories kit, bottled water, welcome fruit basket, 220V outlets and Wi-Fi connection (charges apply). 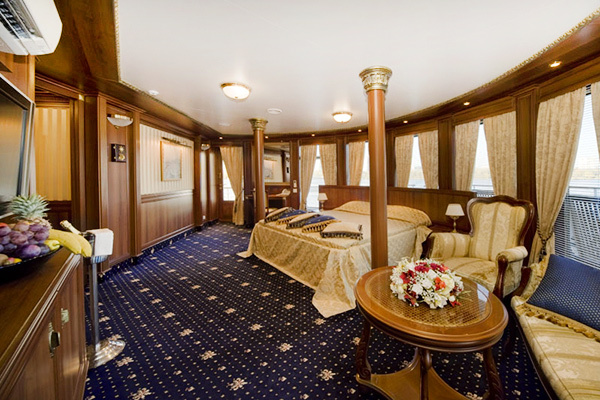 Owner's Suite is the most luxurious accommodation type onboard and are located on the Middle Deck. 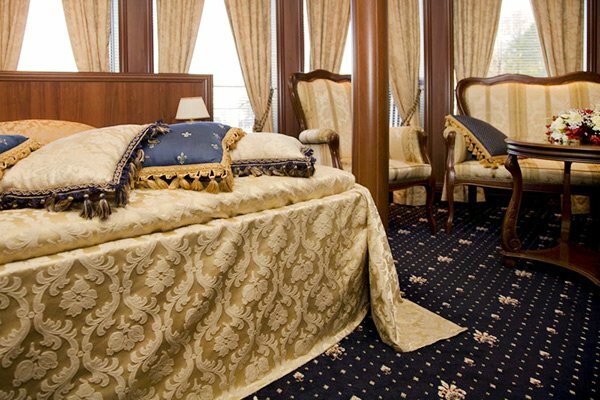 It comes equipped for double occupancy and feature a large double bed, private panoramic terrace, large picture windows, private bathroom with shower, a spacious closet, a sofa, a desk, two armchair, air conditioning, direct dial telephone, flat-screen TV, private electronic safe, minibar, radio, bathrobes and slippers, hair dryer, bathroom accessories kit, bottled water, welcome fruit basket, 220V outlets and Wi-Fi connection (charges apply).